This morning we've got news for you of the latest smartphone rumours, some extra skills coming to your Amazon Echo, and a collection of very appealing gaming laptops from Dell and Alienware. It's our regular tech news roundup, courtesy of our friends at TechRadar. After a host of leaks – many of which we've featured here – it now looks like the Moto G6 range of phones is going to see the light of day on the 19th of April. That's according to an invite sent out to the media, so it's a pretty safe bet we'll see the phones then. Keep your eyes out for news on that day if you're interested in mid-range Android handsets – Lenovo's Moto brand has recently carved out a reputation for excellent value phones. Add a set of Echo Buttons to your Amazon Echo and you can already play some fun quiz games with the whole family, but the capabilities of these add-ons are about to take off: Amazon has announced that it's giving third-party app developers access to the code needed to control the Buttons, which means you should see a host of new titles appear with Echo Button support. They're currently £19.99 for a pack of two on the Amazon site. Back to the smartphone rumours, and the OnePlus 6 is one of the 2018 flagships we're most looking forward to – the general consensus is that it'll appear sometime in the next month. Well, thanks to some digging in a Bluetooth certification device, we now know (or think we know) that the phone is going to come with a set of wireless earbuds, most likely successors to the Bullet V2 headphones OnePlus has already released. Stay tuned. Dell and its Alienware brand have been previewing a slew of new gaming laptops that take advantage of the latest Intel chips. If you want the fastest, most powerful laptops on the market, these are worth a look – a choice of configurations are available, and you should see a 10 percent increase in performance over previous generations. Improved cooling technology and a simple overclocking tool are also included on the Alienware models. And back to the smartphone rumours... again. 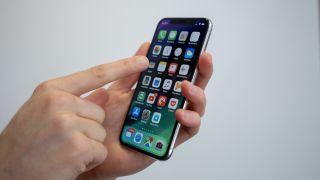 The word on the Apple street is that the company is developing two new technologies that may be making their way into iPhones in the next few years: curved screens and a touch-free interface. If you've always wanted to wave your hand above a phone to dismiss a notification, you might soon get a chance, but it's unlikely that either of these innovations will appear in time for this year's iPhone.